A memoir of one young man's coming of age on a journey across America--told through the stories of the people of all ages, races, and inclinations he meets along the way. Life is fast, and I've found it's easy to confuse the miraculous for the mundane, so I'm slowing down, way down, in order to give my full presence to the extraordinary that infuses each moment and resides in every one of us. 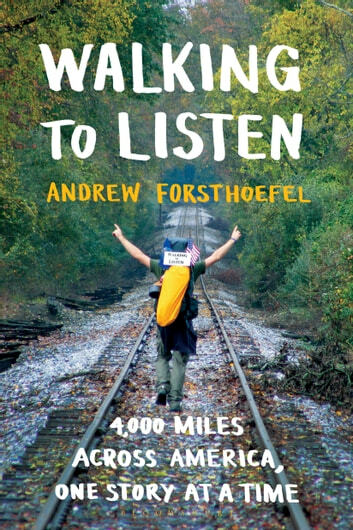 At 23, Andrew Forsthoefel headed out the back door of his home in Chadds Ford, Pennsylvania, with a backpack, an audio recorder, his copies of Whitman and Rilke, and a sign that read "Walking to Listen." He had just graduated from Middlebury College and was ready to begin his adult life, but he didn't know how. So he decided to take a cross-country quest for guidance, one where everyone he met would be his guide. In the year that followed, he faced an Appalachian winter and a Mojave summer. He met beasts inside: fear, loneliness, doubt. But he also encountered incredible kindness from strangers. Thousands shared their stories with him, sometimes confiding their prejudices, too. Often he didn't know how to respond. How to find unity in diversity? How to stay connected, even as fear works to tear us apart? He listened for answers to these questions, and to the existential questions every human must face, and began to find that the answer might be in listening itself. Ultimately, it's the stories of others living all along the roads of America that carry this journey and sing out in a hopeful, heartfelt book about how a life is made, and how our nation defines itself on the most human level.